Filmoria's 10 days of Halloween continues with the publishing of the feature 10 Movies with Killer Kids. I contributed the entry on Macauley Culkin in The Good Son. Any excuse to watch that film again and I'm there. I was only twelve when this film came out and I loved Home Alone so much that I was determined to see the return of Culkin. Unfortunately I had to wait for it to be released on video but I wasn't disappointed. 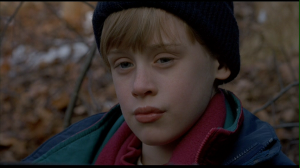 Culkin swears, smokes and turns seriously psychotic. And sweet little future hobbit Elijah Wood has to put up with Culkin gradually becoming more and more threatening to all around him. It's a great thriller and I highly recommend it. The rest of the feature is written by Filmoria's Lesley Coffin and features a range of really creepy kids from films like The Omen to Children of the Corn. You can check out the 10 Movies with Killer Kids at Filmoria here. Also published today is the first of Filmoria's must-see horror movies from Amanda. 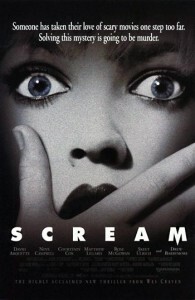 This time it's Wes Craven's classic post-modern slasher with smarts Scream. Finally for today, the first of two articles I have written this week on Saw. For this one I wrote a slightly personal and vaguely academic review of the film that started the biggest horror franchise of the new millenium. Check out my review of Saw at Static Mass Empororium now. What are your favourite creepy kids from horror movies? What do you like better, Saw or Scream? I Love That Blog Post #15 HALLOWEEN SPECIAL! What is 'The Scariest Film Ever Made'?